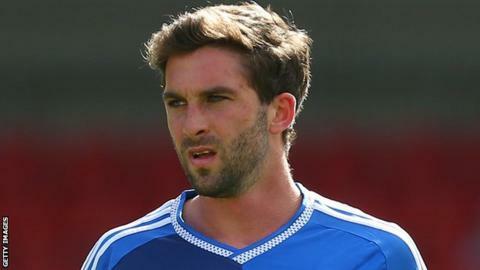 Wigan striker Will Grigg scored his third goal of the season. Striker Will Grigg scored a dramatic equaliser in stoppage time for Wigan Athletic to deny Millwall their third straight away league victory. Michael Jacobs gave the Latics the lead after the break when he linked up with Francisco Junior to fire the ball home. Fred Onyedinma levelled by rifling in Jimmy Abdou's blocked effort before Mark Beevers headed Millwall in front. But, after Lions keeper Jordan Archer was caught out of position, Grigg poked home Tim Chow's cross to seal a point. "The desire by the boys was outstanding and shows the team has real confidence to come to a place like this and go behind and really go on like they were going to win the game. "Glass half-full definitely, really proud of the players, we could have won the game in the end. "Fair play to my group of players, there's honesty, there's desire, hunger to want to play, in a small tight squad." Match ends, Wigan Athletic 2, Millwall 2. Second Half ends, Wigan Athletic 2, Millwall 2. Attempt saved. Michael Jacobs (Wigan Athletic) right footed shot from outside the box is saved in the bottom right corner. Goal! Wigan Athletic 2, Millwall 2. William Grigg (Wigan Athletic) right footed shot from the centre of the box to the bottom right corner. Attempt saved. Sanmi Odelusi (Wigan Athletic) header from the centre of the box is saved in the centre of the goal. Substitution, Wigan Athletic. Sanmi Odelusi replaces Reece James. Corner, Millwall. Conceded by Richard O'Donnell. Corner, Wigan Athletic. Conceded by Jordan Archer. Substitution, Wigan Athletic. William Grigg replaces Max Power. Attempt saved. Michael Jacobs (Wigan Athletic) right footed shot from outside the box is saved in the top right corner. Goal! Wigan Athletic 1, Millwall 2. Mark Beevers (Millwall) header from very close range to the centre of the goal. Corner, Millwall. Conceded by Donervon Daniels. Attempt missed. Aiden O'Brien (Millwall) right footed shot from outside the box is high and wide to the left. Goal! Wigan Athletic 1, Millwall 1. Fred Onyedinma (Millwall) from a free kick with a right footed shot to the bottom left corner. Foul by Francisco Júnior (Wigan Athletic). Tim Chow (Wigan Athletic) wins a free kick on the left wing. Substitution, Millwall. Steve Morison replaces Shane Ferguson. Substitution, Millwall. Fred Onyedinma replaces Ed Upson. Hand ball by Tim Chow (Wigan Athletic). Ed Upson (Millwall) wins a free kick on the left wing.